BUXTON — With a dredging project at the South Ferry Channel expected to start soon, another of the Rollinson Channel recently completed, and a third planned in the coming months in the Sloop Channel, members of the Dare County Waterways Commission, for a change, heard more concerns last week about waterways other than Hatteras Inlet. Challenges have yet to be resolved with proposed projects in Manteo, Colington Harbour, Avon and Oregon Inlet, commissioners learned during updates at their regular meeting held this month in Manteo. Discussion about planned maintenance work in the South Ferry Channel between the inlet gorge and Ocracoke prompted none of the worry heard previously, with positive results anticipated from the project. “If everything goes well, we should end up with a wider and deeper channel than we started with,” engineering contractor Ken Willson, with Wilmington-based APTIM, told commissioners in a phone conference. A construction meeting about the South Ferry Channel project is expected to be held by week’s end. With a go-ahead nailed down, the project could start as soon as the next day. Since the goal is to dredge for 21 days, Willson said, there appears to be openness to extend the permit beyond the seasonal dredging window into early April. 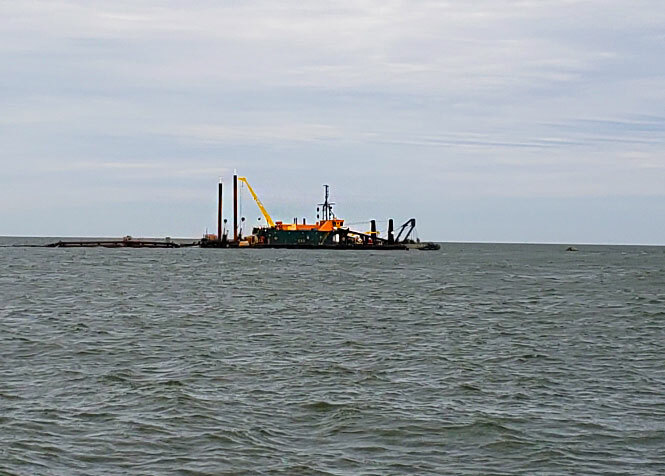 Also, this year the Rollinson project, an authorized federal project done annually by the U.S. Army Corps of Engineers, included clearing a persistent low area at the end of the channel that had been pinching and creating hazards for vessels going in and out of Hatteras Harbor. And despite an expected 7-to 8-month wait for permits to dredge the Sloop Channel, an area of concern where the channel zig-zags has gotten a little deeper lately – at least for the time being, Lance Winslow, state Ferry Division environmental supervisor told the panel. A recent survey also shows that the channel has moved south, he added. “That’s good news if it’s opened up some,” Coulter said. Meanwhile, some shoaled areas in Oregon Inlet are still problematic, and moving heavy equipment into the inlet to prepare for demolition of the old Bonner Bridge has been difficult. Shoaling at the main navigational channel at the old Bonner Bridge is too severe to get a dredge in there, said Steve Shriver, team leader at the Corps’ survey section in Wanchese, pointing to a red “lump” in the most recent survey that showed as little as 2 feet of water. “Unfortunately, there’s been no improvement . . . It’s kind of deteriorated a little bit,” he said. Shriver said that the Corps is keeping a close eye to take advantage of any improvements and quickly get a dredge out there. Not only has the severe shoaling forced boaters to find deeper water to the south, it has created a significant challenge to bridge contractors who need to use large cranes and barges to remove the old bridge. Roger Bullock, the Corps’ chief navigator, told commissioners that one crane was able to be modified, but they’re still working on a way to move another crane from the east side to the west side of the bridge. 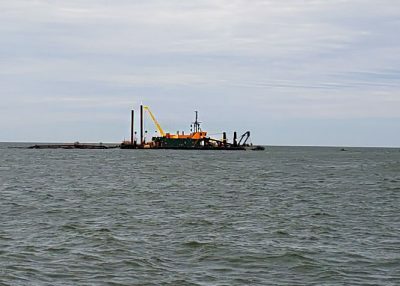 Another project, dredging of Manteo channel, Willson said, has been complicated by new information from a recent survey that shows “significantly greater” amounts of sand would have to be removed from the intersection of the Pamlico Sound and Shallowbag Bay in order to provide clear passage to the state-owned Elizabeth II. The wooden ship, built to represent the 16th century vessels that sailed from England to Roanoke Island, has been stuck at its homeport at Roanoke Island Festival Park for several years, prevented by the shoaling from getting its annual maintenance at the Manns Harbor shipyard. Addressing another issue that has been tough to solve, Willson said that a suitable location to deposit the dredge material from the proposed Manteo project has yet to be determined. After reviewing a number of options, he said, the answer may be that a series of spoil sites will be required. In other updates, Avon resident Jack Bennett gave a brief summary on the Avon Harbor dredge project for which he is seeking funds. He said a man named Basil Hooper stopped by his property and questioned his right to have any spoil deposited on his property. Bennett said he has a designated spoil site on his property, and is not trying to benefit from dredging. Bennett said he would provide a copy of the document to the commission that shows the designation. Commission administrator Ann Daisey also informed the panel that a dredge project in Colington has been delayed because the contractor’s dredge had sunk. 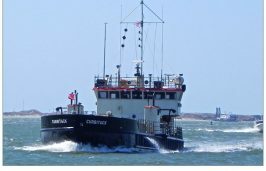 In another matter, she said that the Oregon Inlet Task Force proposal to secure year-round dredging by the Corps in Oregon Inlet had to be delayed when the applicant was informed by the National Park Service that it “owns the inlet.” Daisey said the application requires a special use permit from the park service, which is expected to be approved. Long-serving member Fletcher Willey told his fellow commissioners that he would not seek to be reappointed when his term expires in June because of family demands. Other members in attendance, in addition to the chairman, included Vice-chairman Ernie Foster and members Dan Oden and Natalie Kavanaugh. Commissioner Danny Couch was absent. A new member, Michael Flynn, a Waves resident who works as the northeast coastal advocate for the North Carolina Coastal Federation, has been appointed to fill the seat of Dave May, who recently resigned. This story is provided courtesy of the Island Free Press, a digital newspaper covering Hatteras and Ocracoke islands. Coastal Review Online is partnering with the Free Press to provide readers with more environmental and lifestyle stories of interest along our coast. Read other stories about Hatteras and Ocracoke.